Compass Chiropractic is a family focused chiropractic office specializing in pediatric, pregnancy, and family care. Dr. Scott is a board certified pediatric & prenatal chiropractic with over 11 years of experience and knowledge. Our goal is to educate, inspire, and empower families in the community to take an active role in their health allowing them to live life to the fullest! Finding the right chiropractor can be a daunting task. Dr. Scott will take the time to listen, he is compassionate, and will take care of you like you are a member of his own family. We hope that you will find this site helpful in learning more about the amazing benefits of chiropractic care! 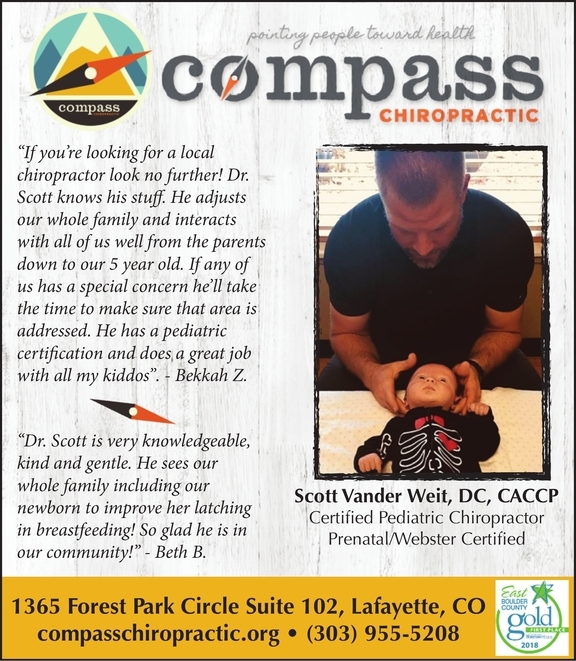 Scott Vander Weit, DC, CACCP | Lafayette Chiropractor | Compass Chiropractic | (303) 955-5208 Email Us for more information. "I started seeing Dr. Scott due to shooting leg pain and numbness. He did an excellent job listening to my concerns and asking questions to guide his care. It took about 6 weeks, but during that time my pain and numbness decreased and after about 6 weeks of regular care, I am pain free."